Farmer's Daughter Quilter: It was all my fault! 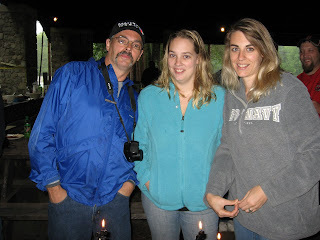 Here's a picture of my son Jack and his daughters, Becki and Nikki at his 50th birthday party yesterday. The girls changed the location at Chenango Valley State Park to Pine Plains where we were under cover and had lots of room. 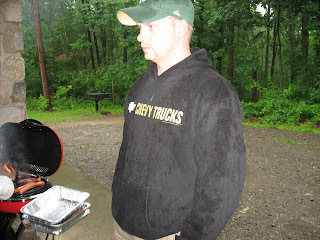 It was pouring rain most of the afternoon. Lots of golf umbrellas were in evidence. Mike, Nikki's husband and Jeremy, Becki's husband, did the cooking. 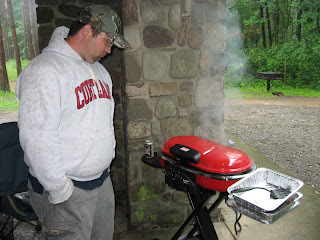 in the pictures Jeremy is at left of grill and Mike is standing off to right side. We brought covered dishes and the food was all delicious. The cake was yellow with a lemon filling, my favorite and probably Jack's too as lemon meringue pie is his favorite. I made a macaroni salad from recipe I got from Lois Ann. Glenda's Macaroni Salad ~ The Kitchen Corner Recipes Jack liked the mac salad when I made it a few weeks ago. Then I baked a double batch of banana blueberry muffins in mini pans. My brother Bruce said the muffins were too small. The grandchildren camped at the park on Friday night, Nikki & Mike in their new camper & Becki & Jeremy in a tent which they took down on Saturday morning before the rain started again. Nikki invited a group of people she and Jack had worked with at Haworth Press. Haworth Press sold to a British company and closed in Binghamton in February 2008. So these people had fun catching up with each other. Back to the sewing machine to see how to rectify a mistake I made sewing on borders.